A thought occurred to me while I was thinking about the new MythTV setup which was that I hadn’t thought about how to control it from the sofa. The old setup I used had a Hauppauge PVR-350 tuner which came with an IR receiver to plug into the PCI card and a remote control. This was straight forward to configure under Linux and MythTV with LIRC. For this new installation I didn’t have that luxury as the tuner card didn’t come with any IR attachments. I considered the possibilities, I could use a wireless keyboard (either bluetooth or usb attached) but that would require a keyboard on the coffee table all the time. Browsing the LIRC, there are a few descriptions to build your own USB IR receiver but I didn’t think my soldering skills were up to that. So I started googling around and ended up finding a Creative RM-1500 remote control with USB IR receiver on ebay for un der 10 quid. The guy selling it had several and confirmed on the auction page that someone else had bought one for use with Linux and MythTV and it worked fine. Done deal! Since receiving it, I can now say it was incredibly straight forward to setup in Mythbuntu. 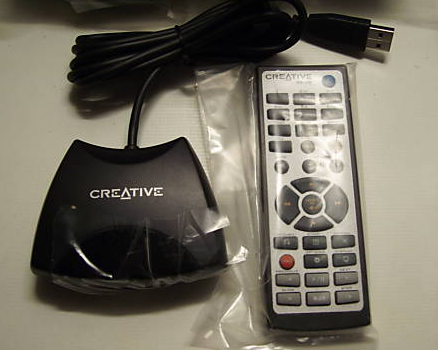 In the MythTV Control Centre just select enable IR receiver and choose Creative USB and then it works! The other issue that I had not considered with the new setup was the audio. How would I get the sound into the TV? The old motherboard used a S-Video cable for the video and an audio cable plugged into the standard ‘green’ audio out, all these cables then connected into the side of the old TV and it worked through the S-Video option on the TV. With the new motherboard and new TV I plan to use a HDMI cable from the PC to the TV and I am not sure what to do with audio ….